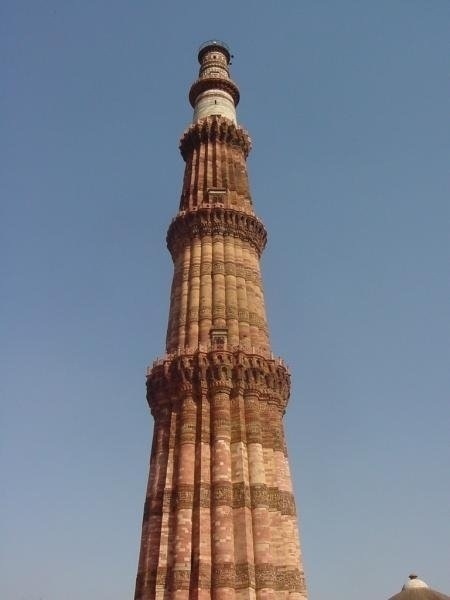 This is the qutub minar tower in New Delhi, built in the 12th century. It is at one time the tallest tower in the whole of india. Nearly went there – but they showed me India Gate in stead. When I asked, bring me to the center of Delhi, everyone became speechless. Why would anyone want to go there … so they kept their mouth shut and brought me to India Gate, and not to a crowded market or something like that. Weeks later google earth showed me the center. Haha! I know! They do try to do that. But a lot would be miss if you shy away from the crowded places in Delhi. Qutub minar complex area is not that crowded though not like Lal Quila in Chandi Chowk (another interesting fort in delhi). Qutub Minar is in Merhauli, South West of Delhi. !I have been living here for quite sometime now and I have not even explored half of all the places I want to visit in India. I have not even been to South of India yet . I am also dying to try riding in a train to Goa and Kerala.That would be awesome. I love the pattern of the tower, It always amazes me how beautiful architecture like this could be built so long ago. I live in Canada, where a building over 100 yrs is historic. The weekly photo challenge had reminded me I had not written about Delhi’s historical monuments yet. This city is filled with amazing Mughal architecture and the stories behind them are quite rich and intriguing. I will post a blog about it soon but now I reblogging my Qutub minar entry because I uploaded more photos of the complex and ruins for those who are interested to know more.